Experts say Trump's backing of legal marijuana could go a long way toward advancing the cannabis business and attracting investors. 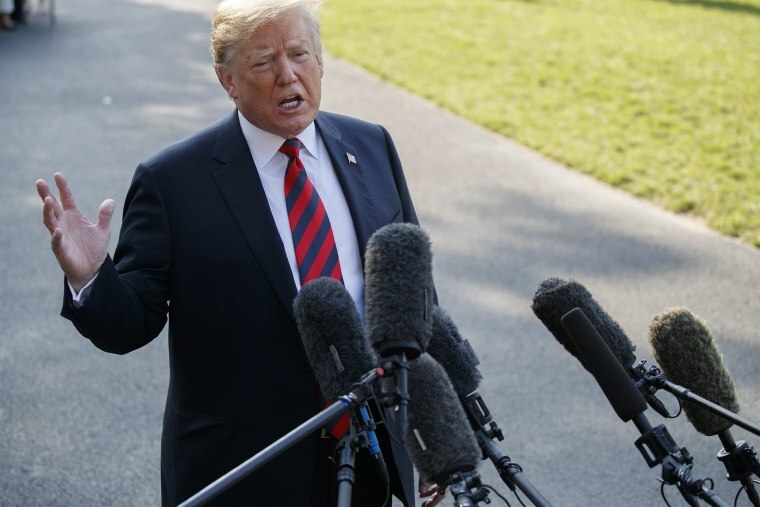 President Donald Trump's expression of support Friday for legislation that would protect legal marijuana activities in states that have approved the drug is being hailed as a possible sea change in American narcotics policy. Speaking to reporters on the South Lawn of the White House before boarding Marine One en route to the Group of 7 summit in Canada, Trump said he was inclined to support the bill, sponsored by Sens. Elizabeth Warren, D-Mass., and Cory Gardner, R-Colo.
"I support Senator Gardner. I know exactly what he's doing," Trump told reporters when asked about the legislation. "We're looking at it. But I probably will end up supporting that, yes." His backing could be seen as yet another rebuke of Attorney General Jeff Sessions, who in January gave U.S. attorneys free rein to enforce federal laws against marijuana even in states where pot is legal. The bill would expressly overturn that policy. The Drug Policy Alliance trumpeted Trump's remarks as another sign that America's attitudes toward marijuana have seen momentous change in the last decade. "To have a bill introduced by two prominent members of both political parties that would allow states to set their own marijuana laws and less than 24 hours later have the president say he's more than open to the proposal means that we are closer than ever to passing meaningful marijuana reform at the federal level," Drug Policy Alliance policy expert Michael Liszewski said via email. The bill seeks to ensure "that each state has the right to determine for itself the best approach to marijuana within its borders," according to a summary. "This is a states’ right issue," Gardner said in a statement Friday. "I was glad to hear the president’s comments this morning and his continued interest in an approach that respects the will of the voters in each state regarding the prohibition or legalization of marijuana." Gardner's office says 46 states, the District of Columbia and Puerto Rico have decriminalized or legalized the drug. Some states, like California and Colorado, allow recreational sales to those 21 and older. Trump's own former campaign adviser, Roger Stone, is now prominently in favor of regulated cannabis, and former House Speaker John Boehner has joined the board of a marijuana company. Even those wary of a president who often says one thing and does another are hopeful. Tom Angell, founder of the nonprofit Marijuana Majority, said via email, "The president's comments may well break the dam." "Hopefully President Trump's support will be enough to convince House and Senate leaders to at least allow a vote on this bill," he said. But opponents of legalization cautioned that it would be premature to celebrate. "I don’t think we should read too much into the president’s remarks," Kevin Sabet, head of Smart Approaches to Marijuana, a nonpartisan group opposed to marijuana legalization, said in an interview. "I think the bill is a free pass for the for-profit marijuana industry. It's really about money." Attorney Aaron Herzberg of the cannabis-focused Puzzle Group Law Firm in Los Angeles said the president's remarks will "knock the socks off the industry" and provide some security for investors interested in the sector. The lawyer noted that long-desired legal banking for pot businesses seems to be an aim of the bill. Indeed, Warren said during a news conference introducing the bill earlier this week, current federal policy "forces a multibillion-dollar industry to operate all in cash." "That's bad for business," she said, "and bad for safety."